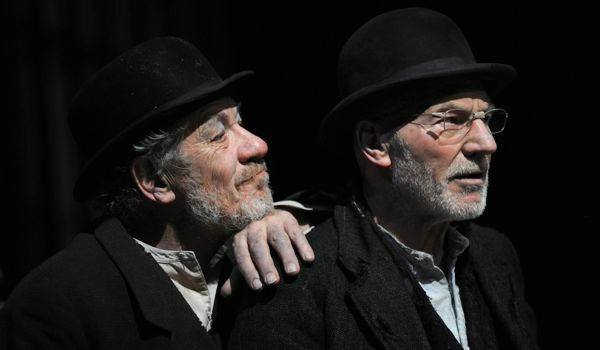 LONDON – So much portentous meaning has been read into Samuel Beckett’s play “Waiting for Godot” that it’s pleasure to be reminded by Ian McKellen and Patrick Stewart what an entertaining show it is. The two “X-Men” adversaries are sublime stage actors and they are simply wonderful in Sean Mathias’ new production of “Godot” at London’s Theatre Royal Haymarket, where their Hollywood star power has helped bring in a record box office advance of £2.4 million. McKellen is Estragon, or Gogo, and Stewart is Vladimir, or Didi, in the tale of two aged ragamuffins who fill their idle days with conversation that ranges from oblique philosophy to music hall banter. The play’s puzzles and profundity do not require the pigeonholes of religion, homosexuality or existential despair to which it has been consigned since it was first performed in English in 1955. Beckett wrote it in French, doing his own translation for the play that debuted in New York in 1956. The two principles spend their time in a wasteland of rubble beside a crumbling brick wall and a dying willow tree waiting for the arrival of a savior who never comes named Godot, which they pronounce “God-o” with the emphasis on the first syllable. Together they make a terrific double act in the manner of Laurel & Hardy, as Beckett intended. Simon Callow is a colorful Pozzo, the pitiless entrepreneur who keeps his slave Lucky (Ronald Pickup) at the end of a rope. The cast makes the most of the play’s wide-ranging musings on the fate of mankind and while Beckett offers plenty of fuel for the imagination, it’s also true that thanks to the splendid performers the audience leaves with a smile. 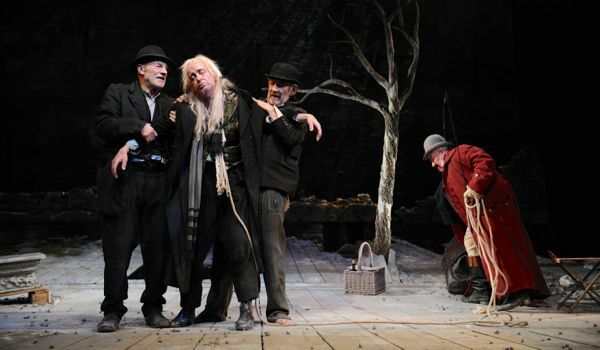 This entry was posted in Reviews, Theatre and tagged 'Waiting for Godot', Ian McKellen, Patrick Stewart, Ronald Pickup, Samuel Beckett, Simon Callow, Theatre Royal Haymarket. Bookmark the permalink.